If either Labour or the Conservatives need to form a “grand coalition” to take power after the election, the parties of Northern Ireland may suddenly find themselves kingmakers. The Tories would look for support to the DUP, while Labour would hope for the backing of the SDLP. The DUP currently has eight seats, the SDLP three. Small numbers, but vital ones if they would help clinch a majority in the House of Commons. What happens in Northern Ireland should therefore be of utmost interest and concern to the main Westminster parties. And last week brought a development that may prove significant indeed. The Ulster Unionists, who currently have no MPs, have proposed an electoral pact with their rivals the DUP. UUP leader Mike Nesbitt has suggested the pact could apply in just two seats. 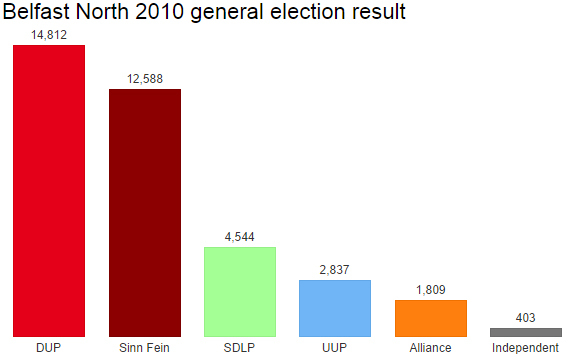 But those two seats just happen to be the most marginal constituencies in Northern Ireland. In both cases the pact would be intended to try and stop both seats being won by Sinn Fein. As such he is proposing the UUP does not field a candidate in Belfast North at the general election and instead encourages its supporters to vote for the DUP. The second seat in the pact is the most marginal seat in the whole of the UK: Fermanagh & South Tyrone. Rodney Connor, who came second, had the support of both the DUP and the UUP. Here, the UUP is proposing the reverse of that in Belfast North: that the DUP does not field a candidate in 2015 and instead encourages its supporters to back the UUP. In both seats the thinking behind a pact is clear. Such an arrangement would avoid splitting the unionist vote and allow another candidate through the middle. But it’s a controversial proposal, and one that Nesbitt himself rejected only two years ago. For the time being it is merely a suggestion and has yet to be formally approved by both the UUP and DUP. Were it to happen and achieve its desired effect, however, it could lead to a change in the balance of seats in Northern Ireland – a change that may help the Tories in any potential deal to form a new coalition. For were the UUP to take Fermanagh & South Tyrone, it would increase by one the number of unionist MPs in the House of Commons and therefore – in theory – increase the number of allies the Tories could call upon to help it form a government. I say in theory, because who knows precisely if and how both the DUP and UUP would enter a coalition with the Conservatives. But the news of the pact is just the sort of thing that, while appearing of minor importance at the moment, could take on major significance after polling day when the arithmetic of a hung parliament starts becomes clear. SF would retain Fermanagh & South Tyrone even if Jesus Christ ran as a Unionist Unity candidate. Nationalist voters will not risk the seat falling into Unionist hands. SF will also throw huge resources into that constituency. The seat has a very deep meaning for them as it was won by Bobby Sands while he was on hunger strike in 1981. 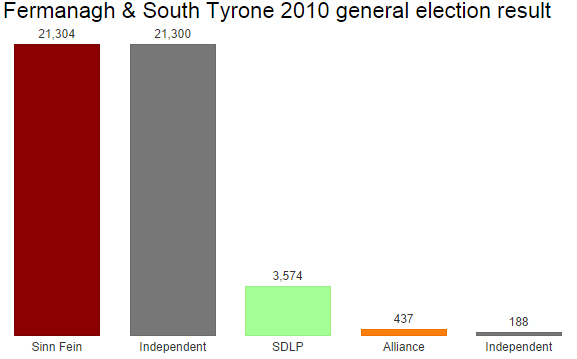 The SDLPs vote halved in 2010, which largely saved Gildernew, and its sole MLA in the constituency lost his seat 2011. Don’t think SF will gain Belfast North, mainly due to boundary changes, although Kelly might get within less than 1,000 vote of taking the seat. Only other seat SF could possibly take would be Upper Bann. However than would require a total collapse in the SDLP vote and the DUP and UUP to get ~30% each. They havn’t a hope in Foyle and South Down, largely because the SDLP still has an effective organisation there and the Unionist minority tactically voting for the SDLP.